Play Coins of Egypt slot game at any NetEnt casino sites. This is a 5 reels and 20 paylines video slot which you can be play using iOS, Android and Windows-operated devices .You can play this Egyptian themed slot with coin sizes of 20p per spin to £200 per spin. The slot offers a jackpot of 3000 coins on your total bet and has two bonus rounds in base game. The game has a very good return of player percentage and is one of the latest video slots from NetEnt. The game features a wild symbol in the form of the golden fly which can substitute all other symbols except the scatter, chest seal and collect symbols and it can give you 15 times of your total stake during Pharaoh Coins Win feature. Coins of Egypt slot is an amazing slot game which is being set in an ancient Egyptian temple. Players will see God for the Sky i.e. Horus and Anubis (God of embalming and the dead) on the both sides of the reels. 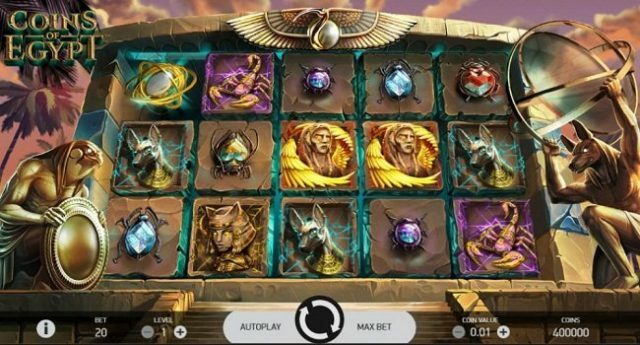 The symbols of this slot game are Wadjet, Bastet and Isis, scorpions, Anubis and 5 different scarab beetles. The latter is the highest paying symbol of this slot machine which can pay you up to 75 times of you total stake if you lucky enough to land 5 of these symbols across a payline. 5 wild symbols across a payline will offer you 150 times of your total stake. One of the main attractions of this slot machine is the free spin bonus feature. It will be triggered when you hit 3 or more of the scatter symbols on reel 1,3 and 5 in the base game.